Greg Albrecht’s fifth book has now been delivered to our warehouse. 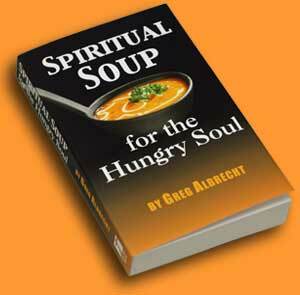 Spiritual Soup for the Hungry Soul is a collection of 48 carefully selected messages Greg has previously given at Christianity Without the Religion. With nearly 400 compelling and inspiring pages, this is the most substantial of Greg’s books to date, so while you may be tempted to read it all at once—we recommend reading a little at a time. In each of these 48 messages, Greg will pique your spiritual appetite with a rich and satisfying Christ-centered meal, offering plenty of food for thought, with a special emphasis on God’s love and grace (and according to letters we receive, people hunger to learn more about God’s mercy, love and grace!). Organized seasonally, with a message designated for each week of the year, Spiritual Soup for the Hungry Soul makes a great devotional or a companion to other studies and resources you may use as you journey through 2010.